Well, I pulled the trigger. I bought myself a Fender Deluxe Nashville Telecaster. It's the white blonde one pictured on that page. The finish is semi-transparent; you can see the wood grain through it. For some reason I couldn't bond with the one at Guitar Center, but I could with the one at a more local dealer. Good thing because they offered me a good deal on my '51 with a nice discount on the Tele itself. It's not in my paws right now. They give free setups for a year with a purchase, so I have them doing the normal setup. They didn't have the GHS Boomer gauge I usually use with Eb tuning (.10-.52) but I decided to try the D'Addario NYXL set of the same gauge. Hopefully I like them. I also asked them to check the fret edges. There isn't sprout per se, but they didn't give the frets a lot of attention when they were cut. A quick once-over with a file will fix that. I had them take the strap lock buttons off my 51 and put them on the Tele. It's a Tele that's bound to be polarizing since it is a thoroughly modern take on one: Vintage Noiseless pups, 12" radius, narrow-tall frets (as tall as jumbo but not as wide), modern bridge, cut-away heel, slightly smaller (by 1mm) nut width. All those features that annoy purists, I like. Clips, pics, et al, after I pick it up on Tuesday. For some reason that I can't fully define, I liked it quite a bit better than the Deluxe Strat. The Tele sounds louder and clearly sustains better acoustically. 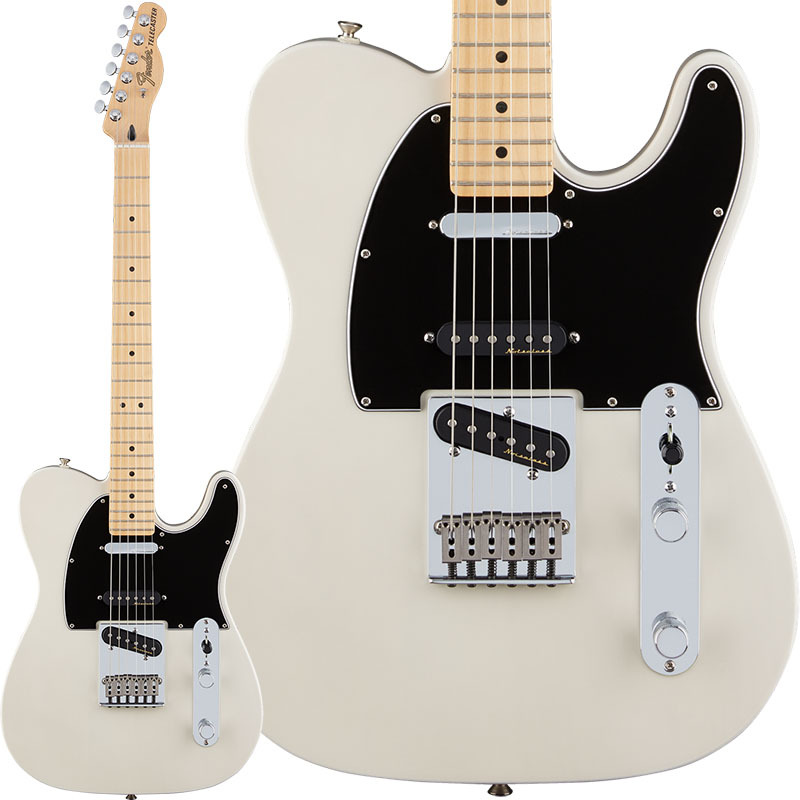 Maybe I just have a thing for Teles since my first electric was a t-style Charvel Model 7. I'm going to leave it unmodded for a while, but at some point I'm definitely adding a switch or push-pull pot for a neck-on mod so I can get the classic Tele bridge and neck combo. As far as why I bailed on the Jackson and ESP LTD guitars I had looked at, the Jackson was cool but would probably require a pickup swap which would raise the price quite a bit. I also would have preferred a hard tail because I wanted to do some different tunings--nothing major bit it's nearly impossible with a floating Floyd. I turned away from the ESP LTDs because I found absolutely nothing about them anywhere on the Internet. Somebody must be buying the SN-1000 series but I sure didn't find anybody. This Tele had remedied all the issues I have with typical Fenders (radius, frets, noisy pups). I just wish I had it right now. Nice! Still a Tele, but there's obviously a quite a dose of Strat genes in there, too. Enjoy!! That's pretty much exactly what I was shooting for. I wanted those Strat in-between sounds. One thing that kept me away from the Deluxe Strat was the whammy bar. I've got a Floyd which, for me, is a better setup. But one Floyd to maintain is really enough. Having said that, my Jackson stays in tune better than any guitar I've ever owned. The only time I have tuning issues is when the strings are getting old. I didn't case for the Strat's bent steel saddles. I know some people swear by them but I think I would've just been swearing at them. This is easily the most money I've ever spent on an instrument, mainly because I got such ridiculous deals on my Jackson and my bass. This was merely a good deal instead of an insane one. I also have to give kudos to the guys at the store. They were all very friendly and helpful. Itching so badly I decided to restring the floating Floyd on my Jackson. That's itchy. That looks like a very cool axe, best of both Strat and Tele world. Congrats ! ...One thing that kept me away from the Deluxe Strat was the whammy bar. Certainly one of the Strat's most contentious features. I've always found it interesting how, between two of the Stratocaster's foremost proponents, Eric Clapton NEVER uses the whammy bar and Jeff Beck CONSTANTLY does. Wow, I want one of those! Congrats buddy! Jeff Beck makes me realize how little I know about the whammy bar. And about the guitar in general. Unfortunately I don't have a ton of time this week, but I'll try to get some clips and pics posted soon. Initial impressions: well, I'm in love. I don't understand people who don't like these pickups or say there's no quack to them. The bridge and middle (Knopfler sound) is to die for. I didn't notice before but there's a bit of flame on the neck too. It just plays so nice. It'll be even better when I make a couple of very tiny tweaks to the setup. The guy at the store did a great job of setting it up with the new strings and taking care of the fret ends. If I ever need major surgery on a guitar, I know I can take it to him. One of the other guys who worked there showed me the Epiphone V he has where a strap lock failed and it broke where the neck and body come together rather violently. I wouldn't have been able to tell anything ever happened. Let's just say I'm very happy with my purchase. My Jackson and Fender have two clear roles. Both do cool things the other can't. If I'm going to pick nits, most of the volume pot's range is in the first 1/3 of its travel. It rolls off quite a bit of high end. I could see a treble bleed in my future. I had heard that for some reason these came with 1M pots. I confirmed that by opening up the control plate. Both volume and tone are 1M audio pots. Odd. ....It rolls off quite a bit of high end. I could see a treble bleed in my future. I "auditioned" several resistor/capacitor combos (all with the two components connected in parallel) and decided that the 680 picofarad cap & 150 Kohm resistor combo sounded best to my ear. "YMMV", as they say. I had heard that for some reason these came with 1M pots. I confirmed that by opening up the control plate. Both volume and tone are 1M audio pots. Odd. That's interesting. For a Strat or Tele with regular pickups, I would expect 1M pots to be excessively bright when wide open, but maybe the noiseless ones are a bit darker?? I haven't played those, so I wouldn't know. Entirely possible. They definitely aren't excessively bright (except for the aforementioned Strat bridge that was not connected to a tone pot). Perhaps this is why some people dislike them, if they install them in a Strat or Tele with stock 250K pups. Are noiseless pups really essentially a kind of humbucker? If so, maybe that's why the 1M pots? I believe, although I'm not 100% sure, that the Vintage Noiseless are a quasi stacked humbucker. I believe the bottom coil is essentially a weaker one to buck hum. I'm sure it doesn't hurt to move the resonant peak up the spectrum a bit. Regardless, I really like them. Maybe they don't sound purely vintage, but for me that's good because I don't like vintage single coils. Way too shrill and they sound like crap when you add much dirt. But to each their own. I'm clearly in the minority on that, at least if The Gear Page is to be believed. OK, at least here's a picture. With the remaining snow and the bright sunshine, it was hard to get a good shot that shows the color accurately without tons of glare. Please pardon the obvious paint issues with my garage. I can only figure out how to link to it on Box instead of embedding it, but this should work.